MyPhone recently announced its latest entry-level smartphone that packs trendy design – the myXi1. 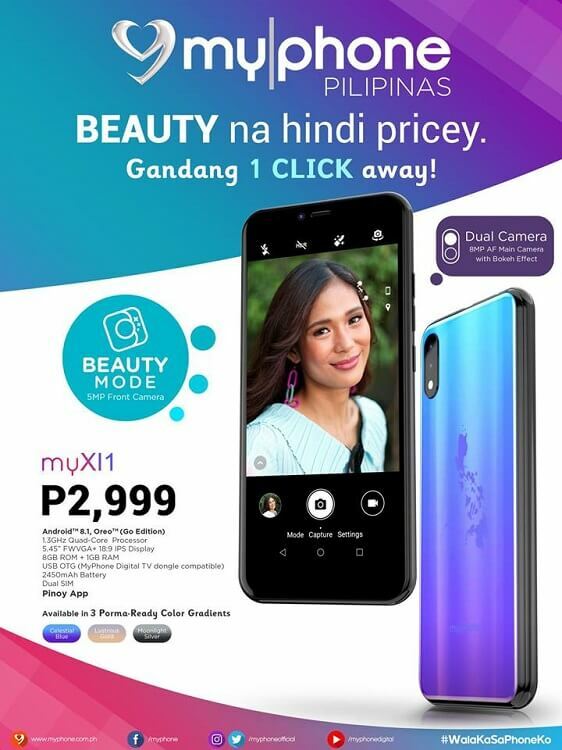 Just like other smartphones, the MyPhone myXi1 is dressed with a stylish gradient design, which is available in celestial blue, lustrous gold, and moonlight silver color variants. Its front, on the other hand, flashes a 5.45-inch panel with an underwhelming FWVGA resolution and 18:9 aspect ratio. Inside, MyPhone equipped it with a 1.3GHz quad-core processor complemented by 1GB RAM, 8GB expandable storage, and a decent 2,450mAh battery. Good thing, the device runs on Android 8.1 Oreo (Go Edition), allowing users to download lighters apps. Moving on to its photography department, the device comes with a dual-rear camera setup but we’re not sure yet about its exact offerings. In case you missed it, a 32-bit quad-core processors usually don’t support dual shooters. For selfies, it is mounted with a 5-megapixel snapper. Moreover, the handset features OTG with MyPhone Digital TV dongle. The MyPhone MyXi1 is priced at Php2,999.